If you are one of those people that use the Kazaa P2P net to download things from Internet, you will have noticed that it is sometimes rather slow in comparison with other alternatives, that is why applications like Kazaa Acceleration Patch are created. 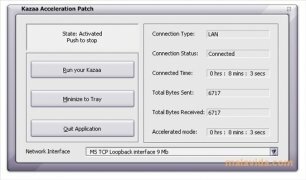 Kazaa Acceleration Patch as name indicates, serves to optimize the data transmission of Kazaa Media Desktop, a classic application when it comes to sharing data over the net, the performance of which is rather slow in comparison with other more modern nets like BitTorrent. 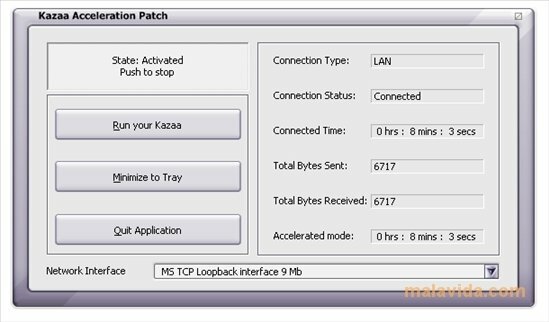 To do so it includes a very simple interface, that we only have to use to open Kazaa, indicate which is our network interface controller and start to enjoy. This Acceleration Patch will make sure of optimizing the downloads. In the applications window, we will see for buttons, that can be used to activate or deactivate the acceleration, open Kazaa, minimize and close, more than enough for an application that has to work in the background to help Kazaa Media Desktop improve its performance.